First off, let me say thanks for giving Springsteen fans a place to keep up with all things Bruce. With two tours of Iraq under my belt, I've greatly appreciated being able to keep up with Bruce news, pics, setlists, etc. while at home and abroad. Keep up the good work! Secondly, I wanted to share this video with you from last year's Memorial Day in Iraq. I had the honor and the pleasure to perform for the troops at FOB Prosperity and I closed my set with "Thunder Road." Armed Forces Network was kind enough to capture it on film and make it available. Hope you enjoy it! Jeff tells us he has a new album coming out this summer on NewSong Recordings called The Line, which features a collection of songs he wrote during his last deployment to Iraq. For more, visit his Facebook and MySpace pages. And we hope everybody has a happy and safe weekend. You already may have heard about the Bruce Springsteen Club at Granite Falls Middle School, right here in North Carolina  and you'll read about them in the upcoming issue of Backstreets magazine. For now, suffice it to say that teacher and Springsteen fan Mike Telesca has been giving these kids one heck of an extracurricular education, from attending E Street Band concerts to producing their own radio shows to... traveling to New York to be on E Street Radio. For the SiriusXM channel's "School's Out! 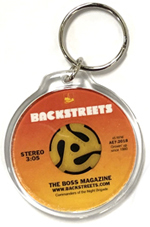 Memorial Day Weekend Special," you'll hear special editions of Be The Boss and song intros from GFMS Bruce Springsteen Club members all weekend, now through Monday. 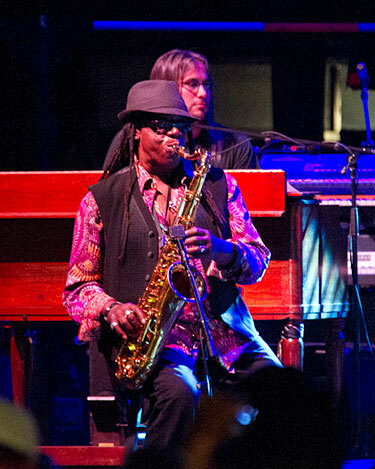 After sharing the American Idol finale stage with Lady Gaga this week, Clarence Clemons is now slated to share a bill with the likes of The Strokes, Public Image Limited, Ziggy Marley, and Red Hot Chili Peppers. It's this year's Summer Sonic festival in Tokyo, where the Big Man will play the Beach Stage (opening for Bootsy Collins  can we get a collab?) on August 14. See summersonic.com and Facebook for info. For more shows by Friends of Bruce and other Shore-related artists  including Memorial Day weekend shows by Sam Bardfeld, Joe D'Urso, John Eddie, Joe Grushecky, JoBonanno, Sonny Kenn, and Southside Johnny  see our Concert Calendar. Stan Goldstein and Jean Mikle, authors of Rock & Roll Tour of the Jersey Shore, have been given walking tours of Asbury Park musical landmarks for more than a decade. On Sunday, June 12, they'll give it, for the first time ever, without the walking. Join them that afternoon for an illustrated talk at the Asbury Park Library, focusing on the rich history of rock and roll in Asbury and the corresponding local landmarks. The event is being put on by the Asbury Park Historical Society as part of its Music Year 2011 series; society president Don Stine calls their printed guide the most definitive book about the local rock and roll music scene and says, "We are really excited to host this first virtual tour and we urge people interested in this wonderful history to attend." Stan and Jean's talk will begin at 5:00 p.m. at the library, at the corner of First and Grand. Admission is $2.00 for members with membership card, $5.00 for non-members. Light refreshments will be served. Copies of Rock & Roll Tour of the Jersey Shore will be for sale at the event; if you can't make it in person, this latest, expanded third edition of the book is also available from Backstreet Records. WHAT'S WRONG WITH BEING SAXY? Forget Madonna: Gaga's new muse is Bruce Springsteen. She swathes song after song in Springsteen's open-road romanticism. (That's Clarence Clemons playing sax on "The Edge of Glory" and "Hair.") Sonically, Born This Way is a club record; spiritually, it's Born to Run, with Springsteen's Marys and Wendys recast in the lead roles. In "Highway Unicorn (Road 2 Love)," Gaga sings: "She's just an American riding a dream.... She's a free soul, burning roads / With a flag in her bra." Gaga's thudding music has something in common with Springsteen's, too  it's a disco-fied update of the Boss' walloping "dinosaur beat." It's an overwhelming sound. In the album's best moments, it simply drowns out all the white noise that surrounds Lady Gaga: You stop thinking about Gaga's newest dress or Tweet or succès de scandale  you stop puzzling over Gaga in the cultural sense  and surrender to the music's crude power. You just dance. 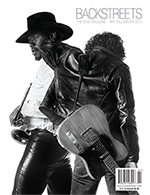 Slate also addresses the saxophone's return to pop music  with the Big Man as the official herald, it seems  in Jonah Weiner's "Bringing Saxy Back": "With the release of Lady Gaga's new album, Born This Way, what was an anomaly officially becomes a pop trend: The saxophone is repopulating." HAPPY BIRTHDAY, "LEFTY" AND "LUCKY"! Last week we felt it well worth noting what would have been the 60th birthday of the late, great Joey Ramone, who played a somewhat obscure but still significant role in Boss history. Today's birthday boy is much better known for his major influence on Bruce Springsteen, among countless others  so of course we have to join the mass recognition of Bob Dylan's 70th birthday today, wishing him many more happy, active years, to boot. In the Star Tribune, Jon Bream gathered testimonials for "Happy Bob day: Dylan's turning 70"; Springsteen's quote: "He is the father of my country." And the 75th birthday of Dylan's fellow Traveling Wilbury, Roy Orbison, was just last month (April 23). Orbison, of course, had just as great an influence on Bruce’s music as Dylan, and even got name-checked in the lyrics to "Thunder Road." Happy belated birthday, "Big O"! In the late '80s, Springsteen inducted both Orbison and Dylan consecutively into the Rock and Roll Hall of Fame. The full transcript and video of Bruce's 1988 induction speech for Dylan can be viewed here. The 1980-89 section of Roy Orbison's official online biography contains an excerpt from Springsteen's 1987 induction speech that mentioned both musical giants: "In 1975, when I went into the studio to make Born to Run, I wanted to make a record with words like Bob Dylan that sounded like Phil Spector. But most of all, I wanted to sing like Roy Orbison. Now, everybody knows that nobody sings like Roy Orbison." History professor Sean Wilentz insists his famous mature student will get no special treatment, adding rather tartly: "Perhaps a reserved parking space but, as far as I'm concerned, he's the same as any other student." 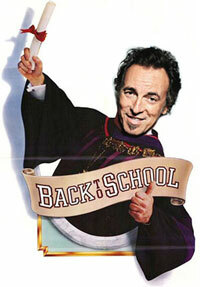 Springsteen himself says: "Higher education and rock 'n' roll aren't mutually exclusive. As far back as the Seventies my mother used to say: 'You know, it's not too late. You can still go back to college.' She was right." Thing is, their scoop  including the quotes  seems to be taken from a just-for-laughs April Fools item we wrote in 2009, with no truth to it whatsoever. Hey The Sun -- didja hear about Bruce's new single? So anyway, no need to go stalking the Princeton campus. And here's hoping Springsteen will have other pursuits in mind by the fall anyway. 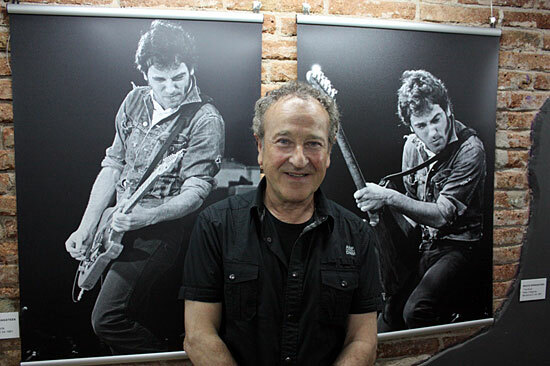 Francesc Fàbregas [above] had the honor of being the official photographer at the now legendary concert in Barcelona in 1981. He was assigned the job by CBS Records and his pictures were published all over Spain, both in newspapers and magazines. Thirty years later his work is on display at the 12 Gats Gallery in Barcelona. 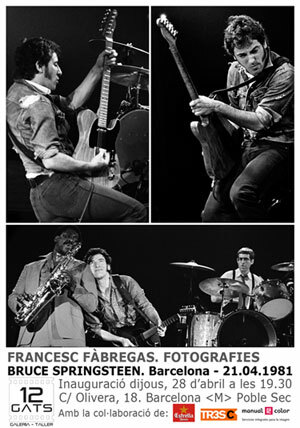 The exhibition focuses primarily on that first Springsteen concert in Barcelona, a concert that Fàbregas photographed from a privileged position in the pit and all over the arena. All the excitement of the show is transmitted to perfection in the wonderful selection of photos from that night. The exhibition is rounded out by more of Fàbregas' pictures taken at the concerts in Montpellier, France in '85 (so close to Spain that it's considered the second 'Spanish' showmore than 10,000 fans crossed the border to see Bruce), the two concerts at Camp Nou stadium in 1988, and the recent performance on the same stage in 2008. The exhibit was due to close today, but has been extended until June 1. Location: Gallery 12 Gats. c / de l'Olivera, 18. Barcelona (Metro Poble Sec). Monday through Friday from 5:00 to 9:00 p.m. The records, for the most part, read Bruce Springsteen. But most concert banners screamed "Bruce Springsteen & the E Street Band." And most record buyers understood the record cover may say "Bruce Springsteen," but the music said "Bruce Springsteen & the E Street Band." Springsteen may be keeping his distance from American Idol, but the Big Man appears to have no such reservations in his latest tweet: "American Idol Finale May 25 Gaga & Big Man present 'On the Edge of Glory' Really look forward to this one!!!" So tune in on Wednesday night to catch Lady Gaga with surely her biggest collaborator ever, live on the American Idol Season 10 Finale. "Once in awhile you get shown the light in the strangest of places when you look at it right." And sometimes it’s vacation tropical light. Okay, working vacation, since I was visiting family along with a gig in Boca Raton, FL. Since it was the last night of Furthur's (Phil Lesh and Bob Weir of Grateful Dead fame) spring tour, I was expecting good things... but I sure wasn't expecting a sit-in by the Big Man. 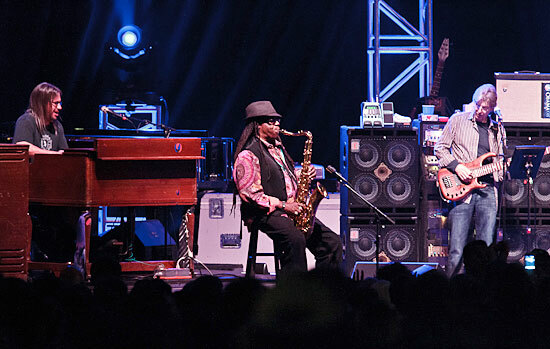 Clarence Clemons, sporting a stylish collared mandala print shirt and vest decided to revisit his past with The Grateful Dead and blow a few tunes with the boys in Boca Raton. He and Al Schnier of moe. joined in to close out the first set on Willie Dixon's "Red Rooster" and Bobby Bland's "Turn On Your Lovelight" under fair skies and warm breezes. Many smiles, both on and off the stage were seen, including one on this photographers face. Easily the bright spot in my concert calendar so far this year... let it shine, let it shine, let it shine. 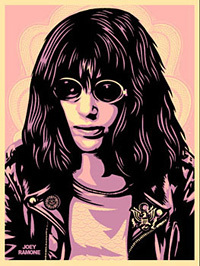 HEY, HO HAPPY 60TH BIRTHDAY, JOEY RAMONE! Today marks what would have been Joey Ramone's 60th birthday. Joey, born Jeffry Hyman, was the lead singer, frequent songwriter and co-leader of The Ramones, the highly influential New-York-based band that became the first punk group inducted into the Rock and Roll Hall of Fame. Tragically, lymphoma killed Joey ten years ago, just over a month before his 50th birthday. Among his many accomplishments, Joey Ramone also played a small but significant role in Bruce Springsteen's musical career, as Bruce himself related in his liner notes for 1995's Greatest Hits: "I met The Ramones in Asbury Park and Joey asked me to write a song for 'em. I went home that night and wrote this. I played it for Jon Landau and, earning his money, he advised me to keep it." The song in question? "Hungry Heart," which in 1980 became the first Top Ten hit both written and recorded by Springsteen. Joey Ramone's own hilarious recollection of asking Bruce for a song, filmed during a 1995 radio interview, appears as part of a bonus video segment on the DVD of End of the Century: The Story of The Ramones, the great no-holds-barred documentary on the triumphs and tragedies of the band's career. In grand punk tradition, Ramone humorously berated "that Landau guy" and remarked that Springsteen "owes us." When the interviewer suggested that perhaps Bruce could sit in with the band sometime, Joey replied that The Ramones didn't want to be onstage with "some Jersey boy screwin' up our song" if he couldn't keep up with their ultra-fast playing. Ramone did, however, conclude the interview on a slightly more serious note by expressing "admiration" for Springsteen. Back in Backstreets #71, we published a list of E Street/Ramones connections, commemorating both Joey's passing and the very first Joey Ramone Birthday Bash (now an annual NYC tradition), hosted by Little Steven Van Zandt. At that time, The Ramones' official website stated that Steven "impressed the hell out of us with his handling of the MC duties. The guy proved not only his performing talent, but his deep knowledge of The Ramones, their meaning, and their place in rock and roll history." In the decade since Joey's death, there have been several other interesting crossings of the paths that led from CBGB and The Stone Pony, respectively. When discussing the We're a Happy Family Ramones tribute album in the April 2003 issue of UNCUT Magazine, the late Johnny Ramone (who co-led the band with Joey) lamented, "My only regret is not getting Bruce Springsteen, who I wanted to do 'Do You Remember Rock'n'Roll Radio?' It would have been perfect for his style but we didn't know how to get him." (Guess everyone at Ramones Central forgot all about that Van Zandt guy.) Six years later, at Boston’s Garden arena, Bruce and the E Street Band did a pretty good job of not screwin' up The Ramones' classic "I Wanna Be Sedated." Van Zandt continues his long-standing love affair with all things Ramones on Little Steven’s Underground Garage. Steve has described his syndicated weekly radio program's format as "groups that inspired the Ramones, groups inspired by the Ramones, and the Ramones" and once noted, "If to a punky consciousness the Ramones are sugar and the Ronettes are broccoli, you play the Ramones into the Ronettes and, because Joey learned to sing from Ronnie and you can hear it, the Ramones become hollandaise and it works." Last week's Underground Garage show, "Ramones Forever & Ever 2011," celebrated Joey's birthday in advance with an extensive Ramones-themed playlist, featuring the radio premiere of a Joey Ramone solo track, "New York City," from his upcoming second posthumous solo album. The complete show is now archived and available for listening here. Gabba gabba hey! 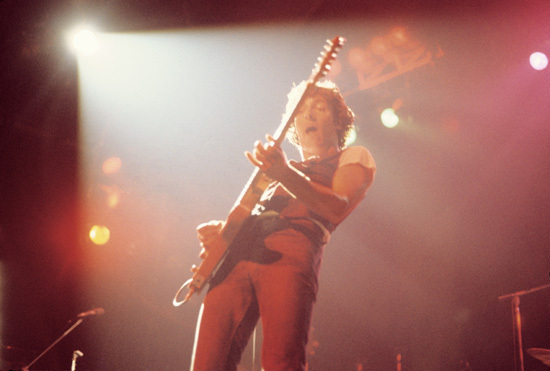 James Shive, a longtime Backstreets contributor, photographed Springsteen and the E Street Band in concert numerous times during their rise from 1974 to 1984  above is a favorite shot from 1976. Many of his images have gone unseen for way too long... but they're online now in The Shive Archive. Along with images of Billy Joel, Bob Dylan, Jackson Browne, Neil Young, Tom Petty, Patti Smith and others, more than 50 live shots of Bruce and the band can be viewed at shivearchive.com (each one annotated by the photographer) and purchased as prints. 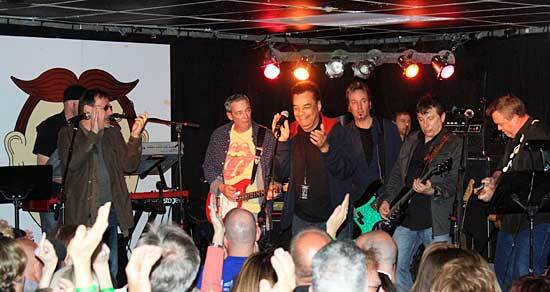 Two months ago, Springsteen celebrated St. Patrick's Day with the Dropkick Murphys in Boston. You may have seen footage online already, but not like this: a pro-shot "Shipping Up to Boston" that is, to concur with the YouTube comments so far, epic. 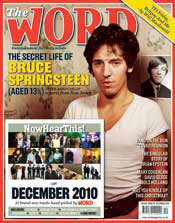 In stock now at Backstreet Records, a small supply of the December 2010 issue of The Word magazine from the U.K., featuring a first look at Peter Ames Carlin's Boss bio in the works. Order here! As the Willamette Week reports, "Another Prominent Reporter Leaves The Oregonian. ": Peter Ames Carlin has "been on leave since January working on a biography of Bruce Springsteen and says he’s quitting to give the book his full attention." Says Carlin: "The paper's needs and mission have shifted away from the kind of work I felt most interested in doing. So that's sad, but I've got a lot of work on the Springsteen book ahead of me...."
The upcoming bio, currently planned for 2012, hit our radar with the December 2010 issue of The Word magazine, which featured as a cover story an excerpt from his work-in-progress: "The Secret Life of Bruce Springsteen (Aged 13-3/4)." Carlin is also the author of Paul McCartney: A Life and Catch a Wave: The Rise, Fall and Redemption of the Beach Boys' Brian Wilson. Visit peteramescarlin.com for more info, including a great story from Joe's Barbershop in Freehold. 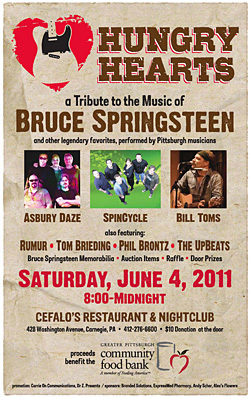 On Saturday, June 4, 2011, more than 25 Pittsburgh musicians will take the stage at Cefalo's Nightclub in Carnegie, PA to perform a tribute to Bruce Springsteen. The event was developed by musicians Jon Daniels and Dave Seaman for the exclusive benefit of the Greater Pittsburgh Community Food Bank in celebration of the organization's 30th anniversary that week. The Hungry Hearts event will feature performances by Asbury Daze, SpinCycle, Bill Toms, Rumur, Tom Breiding, Phil Brontz, The UpBeats, and more. "Each musician has gladly volunteered their time and talent as a gesture of recognition for the Food Bank's 30 years of service in Pittsburgh," said Daniels. "We chose to produce a Springsteen tribute to reflect Bruce's generous support of the Rainbow Kitchen and the moral imperative we share in tending to the basic needs of families within our community." Daniels added, "Admittedly, it hasn't hurt that we're all dedicated fans, so the opportunity to play an evening in tribute to The Boss has created something extraordinary... and it just continues to amplify as more and more people get involved." Fans can look forward to an evening of favorites that cover every phase of Springsteen's career as well as memorabilia, raffles, an auction and other fundraising initiatives. Dinner reservations are available at Cefalo's by calling 412-276-6600. Tickets are available at the door for a $10 donation. For more info, visit Hungry Hearts on Facebook. "Hair," the song Lady Gaga says has "this Springsteen vibe to it," is the second track released from her forthcoming Born This Way to feature Clarence Clemons on saxophone. C says: "It made so much sense. It's a story about growing up.... She said 'we'll put the tape on and you just play. She said to me, 'Play from your heart. Play what you feel.' It was all very pure." Too bad we don't hear more of that -- let's go, remixers, turn up the Big Man! 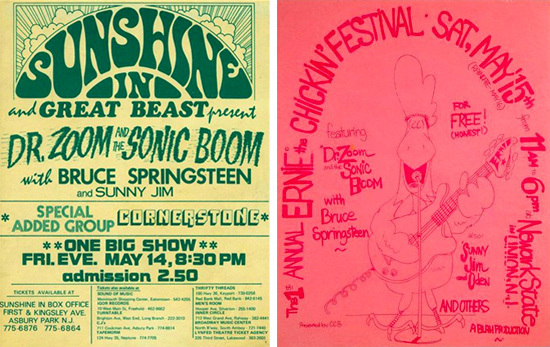 This weekend marks the 40th anniversary of the two shows, on May 14 and 15, 1971, by Dr. Zoom and the Sonic Boom, which Carl "Tinker" West calls "the original Upstage Jam Band." The ridiculously big band featured Bruce Springsteen and future E Streeters Steven Van Zandt, David Sancious, Vini Lopez, and Garry Tallent, as well as loads of local pals like Southside Johnny, Albee Tellone, Big Danny Gallagher, Johnny Luraschi, Kevin Kavanaugh, and many more. As well as a Monopoly board, of course. See the Facebook page for an anniversary celebration, including photos, reminiscences, the band origin story from Tinker, and more. One of the many things I'm grateful for having been introduced to by Bruce Springsteen is the work of Dale Maharidge and Michael Williamson. Since learning of their book Journey to Nowhere: The Saga of the New Underclass in the Tom Joad era, I've devoured everything they've published together: going back to catch up on And Their Children After Them and The Last Great American Hobo, and following their work through Homeland and Denison, Iowa. 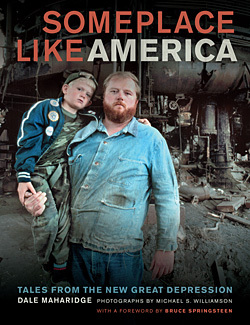 In 1996, Springsteen contributed his thoughts to a new edition of Journey to Nowhere; 15 years later he's introducing Mahardidge and Williamson's work again, with his foreward to their new Someplace Like America: Tales From the New Great Depression, published by University of California Press. 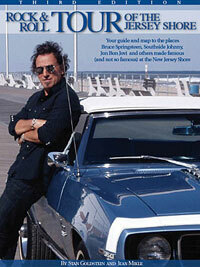 Knowing that many other Springsteen fans appreciate these great books too, Backstreets is honored to host a blog, The Road to Someplace Like America. Dale has been dilligently crafting a series of videos that chronicle their 30 years of traveling around the country, reporting on America's "new underclass," hopping trains, exploring the ruins of the Jeannette Blast Furnace in Youngstown with Springsteen... and in the coming weeks we'll be posting them here. Thanks to Dale and Michael for sharing their stories with us, and we encourage you to check out Someplace Like America: It's on sale now in our online shop, also available from UC Press, and you can visit the book's Facebook page for additional images and more. I'll let them take it from here. C.P. Visit The Road to Someplace Like America blog page for a third video online now, and many more to follow in the coming weeks. 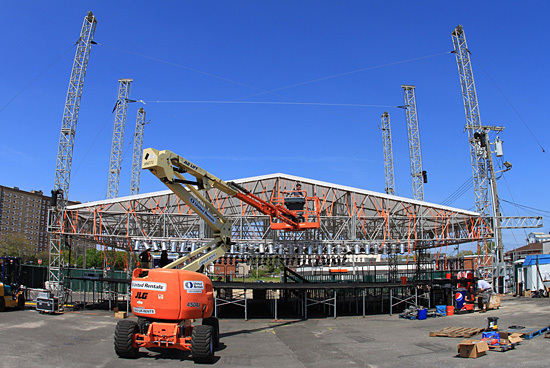 In Asbury Park, NJ, one of the sure signs that spring has arrived is the sight of the Stone Pony outdoor stage being erected for the summer concert series [above is a view from today]. The Pony will feature a bunch of acts on the Summerstage, with Social Distortion up first, playing a sold-out show this Saurday night. The memory of Mike Ness's stop at the Pony three years ago will be surely in the heads of some, when Bruce showed up to play with him on May 17, 2008. Other shows on the Summerstage 2011 schedule include the always jam-packed Southside Johnny on July 2 for the holiday weekend that, for many, literally centers around his show at the Pony. Visit stoneponyonline.com for further info. 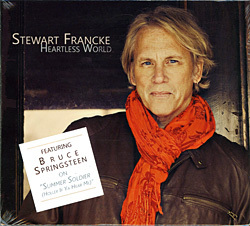 FIRST LISTEN: BRUCE & STEWART FRANCKE'S "SUMMER SOLDIER"
Bruce Springsteen's new duet with Detroit's Stewart Francke is streaming online  listen now at People.com! "Summer Soldier (Holler If Ya Hear Me)" is "the story of a dying soldier in one of America's Mideastern wars," as Francke's press release describes it; "the song relates the soldier’s thoughts at the same time it comments on the notion of American Exceptionalism and how we militarily export our way of life and call it defense." Francke says, "I hope the song works on a personal and political level... My job is to tell a story from the most human standpoint and say we can condemn the wars but support our troops." As for working with Springsteen, Francke says, "This is a tremendously cool thing for Bruce to do, and of course a real honor. It was always his voice I heard on the call and response part of this track, but figured it would remain just a wish. He found something in it compelling enough to join me, and I’m still a bit knocked out about it all. He's been the quintessential artist of our time  the guy who wrote the book on how it's done." "Summer Soldier" is the first single from Heartless World, Francke's 11th album. Stewart tells us the track with Bruce "turned out really cool  but I'm proud of the whole record and think Backstreets readers and Bruce fans will dig it." You can order the CD now directly from his website at www.stewartfrancke.com; the album will be available in digital stores later in the month. We'll maintain a poker face while posting a Lady Gaga song on Backstreets.com -- if only because we know better than to cross the Big Man. (We might also secretly think it's catchy.) "The Edge of Glory," a teaser from Gaga's forthcoming Born This Way, was just released this week and features Clarence Clemons on sax, from the three-minute mark through the end. You can dowload now from iTunes. Clarence also appears on another track on the album, "Hair," which according to ABC News Radio will be released Monday, May 16. For more about "Hair," and a refresher on how Gaga and Clemons hooked up, see RollingStone.com. With SiriusXM Satellite Radio refitting their channels this week, E Street Radio is now channel 20 on both Sirius and XM. Tune in to Live From E Street Nation tomorrow as Dave Marsh's guests include both Airborne Toxic Event (currently on the Boss radar for their cover of "I'm on Fire") and Scott Kempner (The Dictators, The Del-Lords). Live From E Street Nation airs Fridays at 10:30 a.m. Eastern, rebroadcasting Sunday nights at 8:00. Also airing tomorrow on E Street Radio: producer Brendan O'Brien's guest DJ spot at 4:00 p.m.; and at 5:00, a replay of the interview between Marsh, Springsteen, and 20 fans in honor of this week's DVD release of The Promise documentary. Tune in to channel 20! 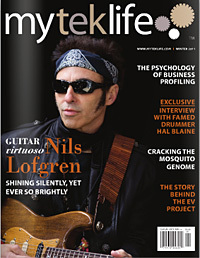 For Nils' current tour dates and more, visit NilsLofgren.com. 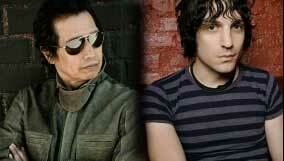 Tickets are still available for the Alejandro Escovedo/Jesse Malin concert tomorrow night at the Count Basie Theatre  and with showtime less than 24 hours away, you can get 'em for half price! With their respective bands The Sensitive Boys and The St. Marks Social, Alejandro and Jesse should make for quite a night of rock 'n' roll in Red Bank, and in addition to being a dynamite Friends of Bruce double bill, the show is also a benefit for the Light of Day Foundation and Joan Dancy & PALS. For more information and to order tickets, visit countbasietheatre.org. The Carousel comes home today, with the May 3 single-disc release of The Promise: The Making of Darkness on the Edge of Town documentary plus bonus features. 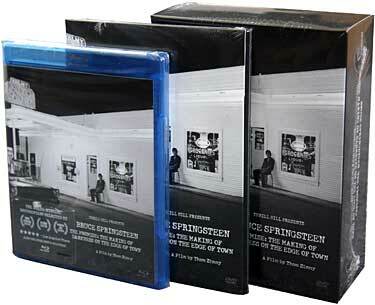 All three configurations are in stock now: the DVD, the DVD/T-shirt bundle (available in Large or XL), and Blu-ray. Congrats to you three, and thanks to everyone who pre-ordered the new DVD/Blu-ray from Backstreet Records  we appreciate your support! The extended family and friends of Kevin Kavanaugh packed the Wonder Bar in Asbury Park on Sunday night to say thanks, pay tribute, and raise money for one of the founding members of the Asbury Jukes. Kevin, who played keyboards with Southside Johnny and the Jukes for 15 years and with numerous other Shore bands, is currently fighting serious health issues. A benefit auction table was doing brisk business with items including an original Asbury Jukes jacket, Bongos signed by Ringo Starr, two Bruce Springsteen signed items, a Tim McGraw signed guitar, tickets for the Colbert Report and the Daily Show with Jon Stewart, as well as photos and other items. Hosted by long time Stone Pony DJ Lee Mrowicki, the Concert for Kevin Kavanaugh included sets from Bob Burger and Lisa Bouchelle, John Eddie and PK Lavengood, Cold Blast & Steel with Lance Larson and Tony Pallagrossi, a Chik-A-Boom/Joey and the Works Reunion, Holme/Cats/Diamonds All Stars, and the Bobby Bandiera Band. Any "Will Bruce Show?" anticipation was largely absent, with the audience there to honor and support Kevin. 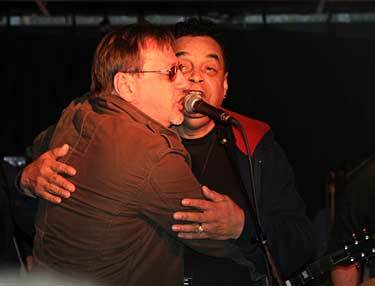 The evening highlight was the appearance of Southside Johnny and Gary U.S. Bonds, who took the stage for several numbers. John spoke again and again about Kevin and his influence on him and just about everyone in the audience. They left the stage but were called back soon, returning for a few more. A worthy benefit seeing the community come together to give back to a man who has given so much in so many ways  as was said many times throughout the evening, here's to Kevin's speedy recovery. 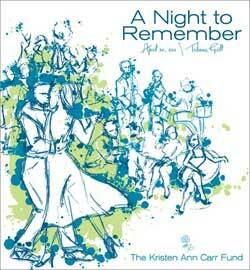 Our congratulations to Lisa and Greg Linn, honored at this year's annual Kristen Ann Carr Fund benefit, A Night to Remember, on Saturday night in New York City. Greg, Senior VP of Marketing at Columbia Records, is Bruce Springsteen's product manager  and all-around swell guy, and a huge fan of the music, and someone to give label execs a good name. If you like how The Promise turned out, as we do... well, for that alone Greg deserves a tip of the hat. As Springsteen wrote in the box set's liner notes: "...thanks to everyone at Sony for their support on this project, especially Greg Linn, who has provided the essential and difficult logistical planning and coordination for the release of this set." 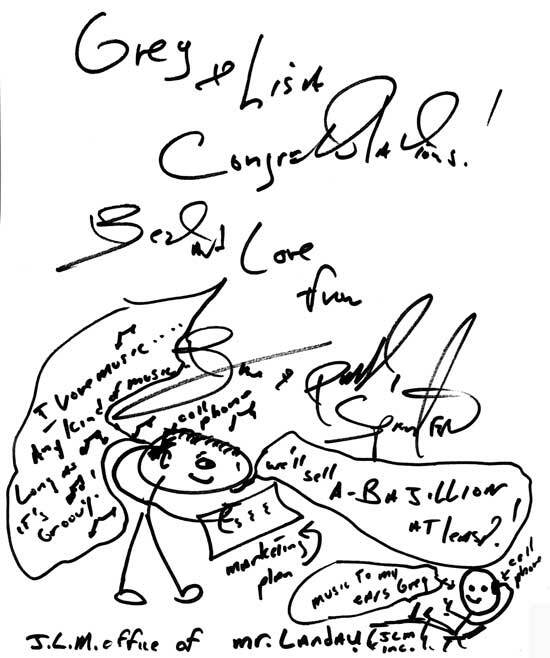 [Bruce's contribution to the event program, above, offers a sketchier take on Greg's role.] 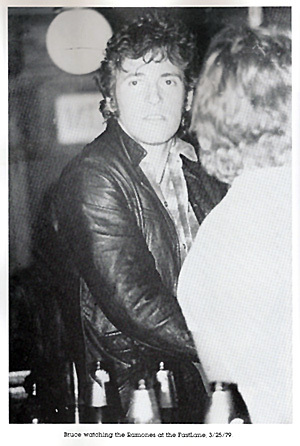 Springsteen, Dave Marsh, and Jon Landau were all on hand at Tribeca Grill to sing the praises of the Linns in person; Bruce thanked Greg for selling all those records, joking that despite his own blue collar reputation, he has "an extravagant lifestyle to support." With three generations of the Linn family in the house for the occasion, and a new generation of the Carr family to celebrate as well, Greg talked about the central importance of family to the good work of the Kristen Ann Carr Fund. Springsteen played the very first KACF benefit back in 1993, a special tour-end concert at Madison Square Garden; this year, marking Kristen's 40th birthday, the fund set up at her request continues working to improve all aspects of cancer patient life, with an emphasis on adolescents and young adults, and to provide grants for cancer research. To learn more about the KACF, visit www.sarcoma.com. You will, too, after watching this trailer for Lilyhammer, the series coming to NRK (Norwegian Broadcasting Corporation) in 2012, starring Steven Van Zandt as Frank "The Fixer" Tagliano. Read more about the series here. 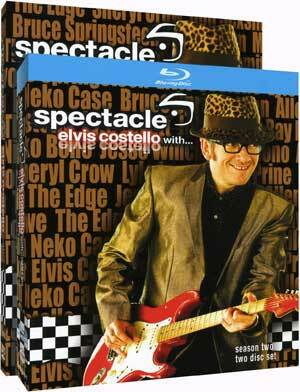 Season 2 of Spectacle: Elvis Costello With..., the bespectacled one's series on the Sundance channel, culminated in a double-sized appearance from Bruce Springsteen, split up for the final two episodes of the season. Filmed at the Apollo Theater in Harlem, the shows feature Springsteen and Costello in conversation and performance. Part 1 includes "She's the One," "Wild Billy's Circus Story," The River" (partial), "American Skin (41 Shots)," and "I Can't Stand Up for Falling Down"; Part 2 has "Radio Silence"/"Radio Nowhere"/"Radio Radio," "Oh, Pretty Woman," "Seeds," "Black Ladder," "Galveston Bay," and "The Rising." This second season, with both Springsteen episodes (as well as Bono and The Edge from U2, and more), comes to DVD and Blu-Ray on June 7, a two-disc set that includes some bonus performances by Elvis and an hour-long behind-the-scenes documentary about the series. We've just started taking pre-orders at Backstreet Records  order yours now and get 10% off the retail price of both the DVD and Blu-Ray. MASH-UP: "Born This Way in the U.S.A."
No dream is too big: Fifth grader Macie invites Bruce to her class to make her teacher's dream come true. Read more in the Rumson Patch; watch her plea on YouTube.